provides recipes that thrill the eyes and delight the taste buds. My mom created this recipe right around the time I moved to the United States. I was all alone and did not know much about cooking at that time - I could basically fry eggs and maybe potatoes. As this was the new favorite recipe for the whole family, my mom kept cooking it again and again. She'd then email me to describe how everyone savored the dish, how they were licking fingers, how they were asking for more. I think she wanted me to move back next to her, and the fresh memories of her amazing cooking made it really difficult to stay far away. In loving memory of my mom, here's her recipe for everyone to enjoy. - Chop the bacon. Dice the bell pepper. Finely dice the onion and yellow squashes (we want them to melt and provide good flavor without being easily identifiable in the sauce). - Cook the bacon and onions in two tablespoons of cooking oil on medium/low heat for about 10 minutes. Stir frequently to make sure that it does not stick to the bottom or burn. - Add the bell pepper and yellow squashes, cover, and continue cooking for another 10 minutes. Stir occasionally, particularly in the first few minutes. - Add a cup and a half of water, spices (salt, pepper, and chili pepper, to taste), remove the cover, and continue cooking for another half an hour. - Add the heavy whipping cream or sour cream, mix until the sauce is uniform, and continue cooking until it simmers. - Serve hot over pasta. 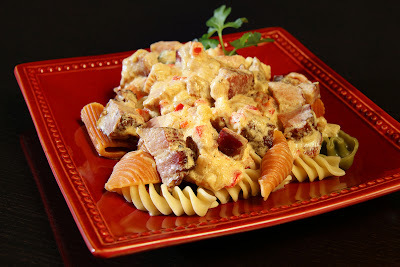 - An interesting type pasta can add a lot to the look of the dish. - You can further use some fresh leaves to add a splash of green to the presentation. This looks wonderful! I'm sure it has a hearty flavor. Thank you for sharing this enticing recipe. Thank you very much, Bridget. Copyright © 2013 Artsy Bites and Blogger Templates - Anime Soundtrack.